I've always enjoyed buying clothes for Gabriel that look like little man clothes- not that I want him to grow up fast but they just seem more timeless and interchangeable. Gap is usually our first go to (outlet or clearance rack typically) because we like the look and it's the best fit we have found so far for our long and lean little man. We try not to spend too much on clothes but do sometimes invest a little more for quality pieces we can see using through multiple children. Where do you shop for baby/toddler clothes? Are there certain items you spend a little more on? Love these outfits! And I was the same when we found out we were having a boy. Now I love putting together outfits for him! I love outfit 1 especially, maybe because he was wearing a very similar flannel today ha. I like to splurge at Gymboree! My kids mainly wear Carter's, Children's Place, and Crazy 8. Have you shopped at Crazy 8 yet? I'm not a fan of the cutsie kid stuff either. 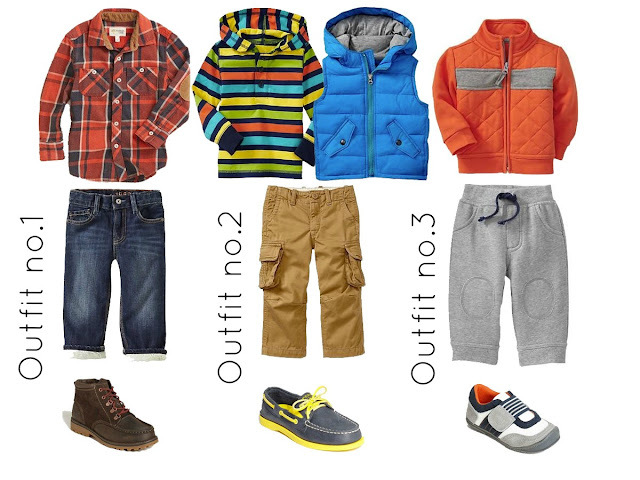 I like both of my kids to look like a mini parent ;) Have fun shopping for fall clothes! I want that flannel so bad! I just love the elbow patches! I went to crazy 8 once before Japan, need to go again! Yes, mini parents! Love these, especially the 2nd from the left! I also love those gray shoes on the right! I like to shop at Old Navy for baby and toddler clothes. They're super cute and and pretty affordable.